The Oakley Entrepreneur Program is designed to strengthen Oakley’s small business and entrepreneur community and help them to grow and expand. 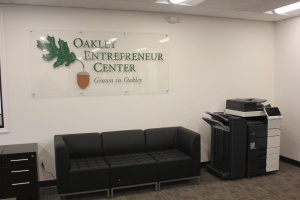 In order to help achieve these goals, the City of Oakley has built the Oakley Entrepreneur Center in downtown Oakley. 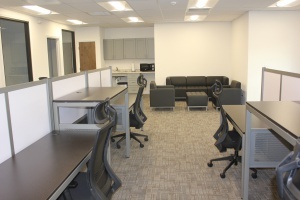 The Entrepreneur Center is located in the upstairs space of the building located at 3330 Main Street, across from the Civic Center Plaza. 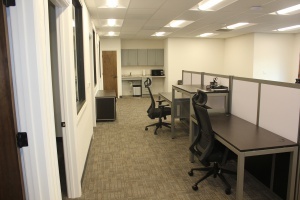 The co-working space will include two co-working desks for four people and a stand-up desk to accommodate two people. In addition there will be couches and lounge chairs. 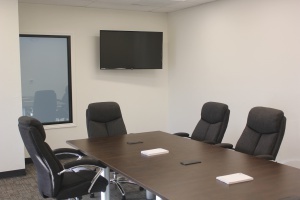 The large conference room can accommodate 10 – 12 people and the small conference room can accommodate four people. It is anticipated that rent for the individual offices will be $350 per month and $250 per month for the co-working space. Rent payments will include all utilities, access to the wireless network and use of a common printer. Tenants will be expected to provide their own laptops and cellular phones. 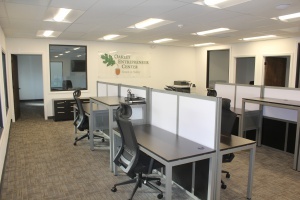 In addition to the use of the facilities, tenants in the Entrepreneur Center can benefit from small business programs offered by Oakley’s Economic Development program, including Business Plan training programs, business workshops, coaching and networking activities. Working from home presents an abundance of distractions. Keeping work separate from home allows you to keep structure in your life and provide you a reason to get out of the house. An office environment creates an energy and mindset that can only come from interacting with fellow workers. In a co-working space, where everyone is busy on their own passion projects, this energy can be contagious. It’s often said that the life of an entrepreneur can be a lonely one. Though you’ll be working on your own business, a co-working space surrounds you with like-minded people who have picked an independent lifestyle that matches yours. Working alone places a barrier between you and people who could potentially help your business. Co-working puts you near people who might have vastly different skill-sets or solutions to problems, allowing you to “pick their brains”. If you’re starting to consider office space, you may not be able to commit to a long-term lease, buy furniture and pay utility bills. A co-working space takes care of these issues and allows you the flexibility you need at this stage of your business growth. If you are interested in being part of the Entrepreneur Center, the City is now accepting applications. Please fill out the application below and return to Oakley City Hall, care of Economic Development. Please note that all of the individual offices have been leased, however co-working spaces are still available. We are excited about the Oakley Entrepreneur Center opening and look forward to better serving Oakley’s small business and entrepreneur community. Please continue to visit this page to track progress and access other documents. Feel free to contact me with any questions or comments you may have. I can be reached at (925) 625-7006 or by email at dalman@ci.oakley.ca.us.